I kicked back and watched the very long director's cut of Watchmen last night, and enjoyed it - but not quite as much as I enjoyed the theatrical release. There was a lot of additional background info, and I suppose if I was unaware of the characters I'd have appreciated it more, but for me it just lengthened the film unnecessarily. So why the sudden interest in a 5 year old movie? Because the previews of Zack Snyder's new film, Man of Steel, has me anticipating the hell out if its release. In a summer filled with movies I would stand in line to see on opening night, this is the one I have the greatest hopes - and fears - for. 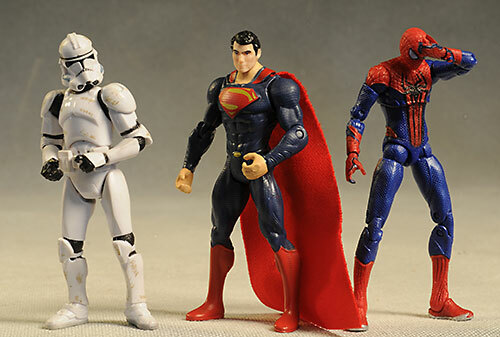 The action figure line is already hitting, in several scales. I've only found the 4" series so far, made up mostly of Superman variants and one Zod, similar to the way the Dark Knight line has the rather lame Bane figure. There's a larger scale series too, but I have yet to come across them. These smaller figures are running around $7 - $8, and hitting mass market retailers right now. The package is attractive, and follows the movie designs. I also like the small size, even with the large accessory. 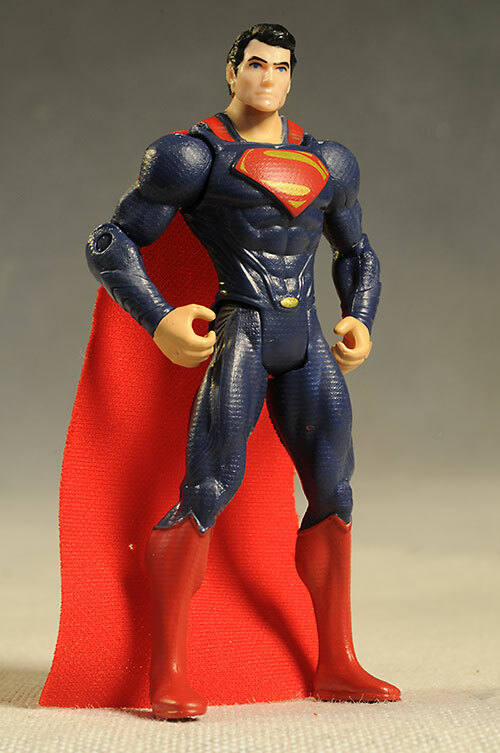 The low score is because of the way the cape is held in place. Like most capes these days, the cloth is threaded through the inner tray. Unlike most capes, it's also held with a plastic T tie, which means there's a hole in the cape. I realize this is a cheap toy, but even a kid isn't going to be happy with a big hole in the cloth. The lower score here might indicate to some that I don't like the portrait, but that's not the case. 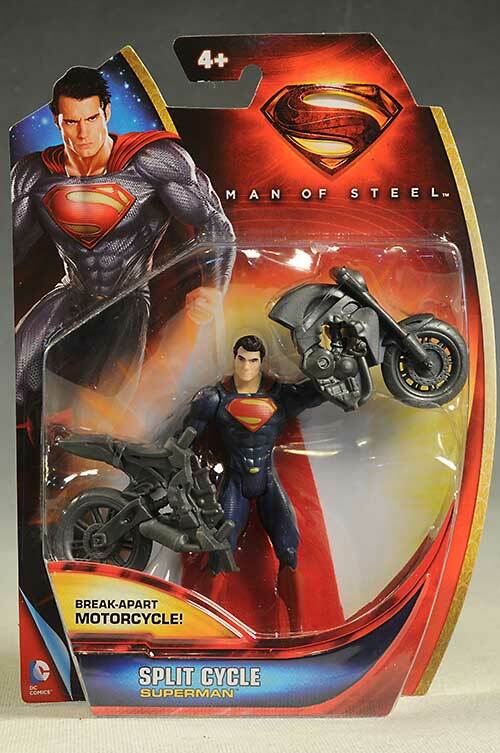 I think they've done a great job capturing the look of Henry Cavill, especially considering the scale. Remember, this guy is only about 4 inches tall, making it tricky to get a sculpt that looks like more than a blob of plastic. But while the likeness is quite good, the figure suffers from weird proportions. The giant shoulders make the head look tiny, and the hands look like basketballs on the ends of his arms. If they were going for a caricature style, they didn't quite get there, but they missed a realistic style just as much. 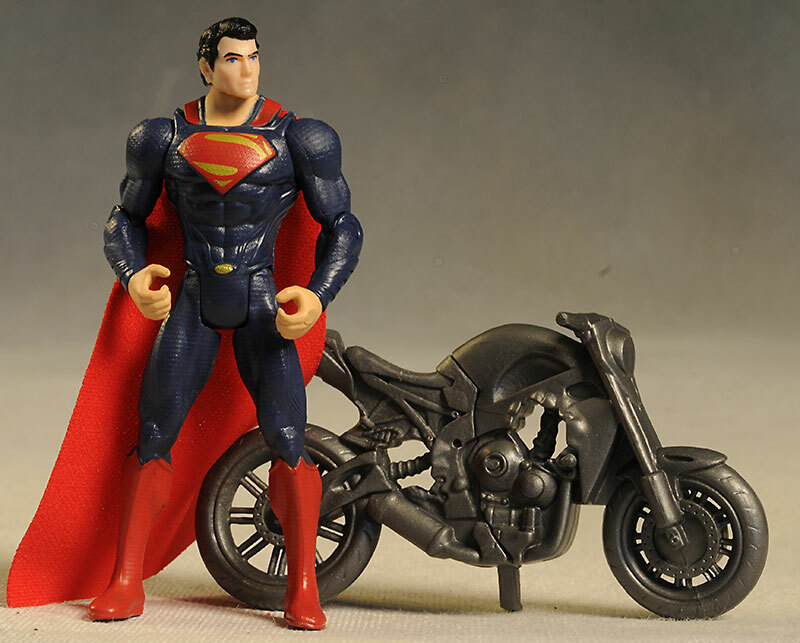 This is a low cost mass market toy - you aren't going to get perfect, lifelike paint work. However, that doesn't mean you shouldn't get decent quality. Here, you get that. The hair line is sharp and clean, the eyes are even, and even the eyebrows are just about perfect. 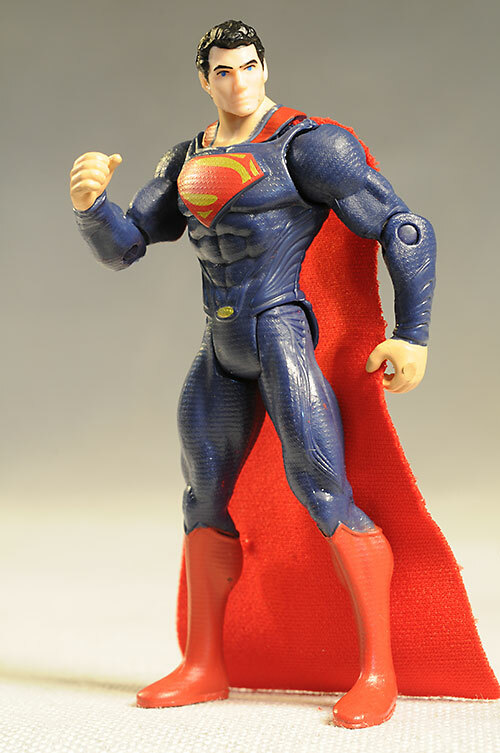 I don't love the cast-in skin color and its shiny finish, but it's a minor nit considering the price of the figure. The costume doesn't have a ton of detail, but the emblem looks great, and the cut lines between the red and blue re very sharp. These new style of smaller figures are most noteworthy for their lack of articulation, but this guy steps it up...slightly. He has a cut neck, and T hips. No surprise there. 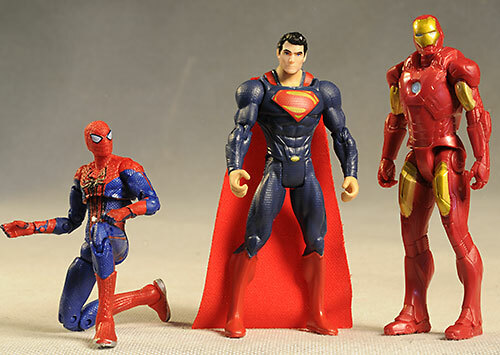 But he also has ball shoulders (pin and disc style), and pin elbows, a step up from something like the Iron Man 3 figures done in this similar style. Not a huge step mind you, but I'll take baby steps. I have no idea if this accessory matters or not in the film - I assume it does - but it's pretty nifty. The bike stays together well, and can stand great thanks to a kickstand on one side. 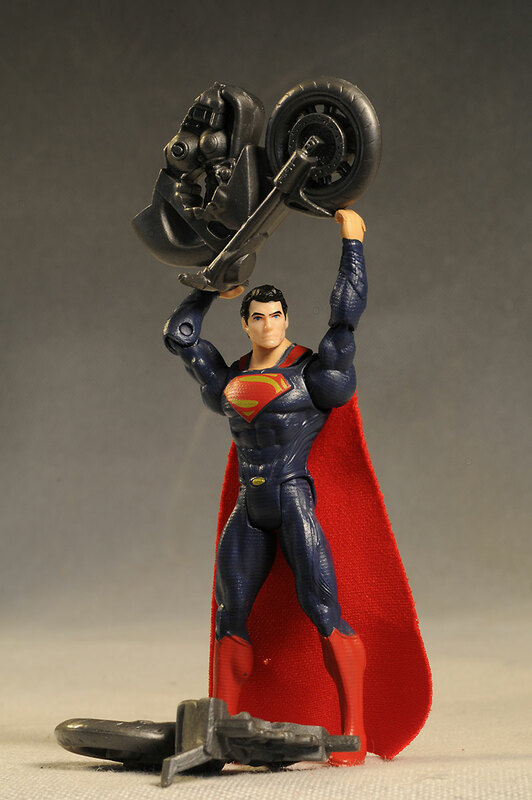 That means other figures in this scale can even ride it, if they have the leg articulation to pull it off. A couple paint ops would have been nice, but that's a minor nit considering the price point. The bike pops in two easy enough, and pops back together just as easily. Kids will be able to manage it on their own without frustration, a key feature for parents. While this guy isn't perfect, he's a sight better than a couple of the other lines in this scale we've recently seen, including DKR and Iron Man 3. Kids can manage with minimal articulation, if the figure has enough conflict play potential, stands well on it's own, and can hold up to rough handling. This one has all three. Even though these guys are only around $7 or so, I'm giving them just an average score here. Why? Because while most figures are admittedly in the $10 range, even in this scale, I just bought a couple more Turtles this weekend for just eight bucks. Considering their size, accessories, and articulation, they make this guy look like a lot less of a deal. I've made it pretty clear with some of the other new 4" figures in this style from Mattel and Hasbro that I'm not happy with the cheapening they're doing. Most have been nothing more than little lumps of plastic, not worth the couple bucks you'll save over the much superior Star Wars style. This figure does improve on it a bit though with a little more articulation and a decent accessory. The portrait is solid too, even if the body proportions are a bit too wonky for my tastes. While he's not perfect, he's a step back in the right direction, and away from the other inferior recent releases. Of course, I have my fingers crossed for the larger figures as well, done within a scale where Mattel generally has a better track record. These are showing up at retail right now, and run around $7 - $8 each. 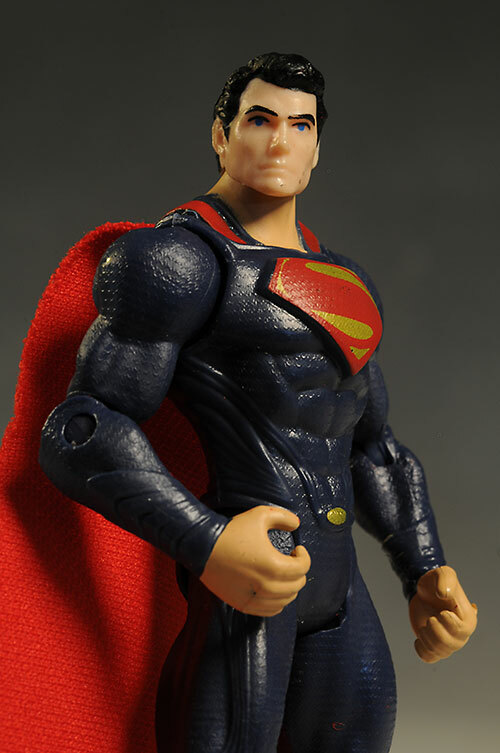 While I haven't covered any other new Man of Steel stuff...yet...I did just recently look at the DCU Superman, and don't miss my review of the best Superman action figure ever produced - the Hot Toys Chris Reeve version.